Let me just start this by saying: when you go to Argentina, dulce de leche is EVERYWHERE. When I went earlier this month with Lucini Italia I was struck by how integral it was to almost every (maybe every?) meal. It is served in sweet little pots with tiny spoons for breakfast where you’re encouraged (encouraged!) to smear it on toast before noon. It’s drizzled over flan, brûléed over the top, incorporated into a cheesecake. The entire trip truly felt like a celebration of food so at every meal I wondered, is this my inspiration meal? Is this what I want to make when I get home?? It wasn’t until my final breakfast in the wee morning hours that I started giving dulce a strong look and wondered what I could do with it that would be new, interesting and accessible. Olive oil infusion was the natural answer. We had spent the previous week meeting the growers of Lucini’s Everyday Extra Virgin Olive Oil and had in fact traipsed around olive farms, feasted in the center of them and watched the last week of harvest. I had recently infused a gelato with olive oil, why not infuse a little dulce de leche?!? Lucky for me (and us), the results were MAGIC. A Dulce De Leche Crepe Cake was a strong recipe contender (and it will still be coming), but it lost out to alfajores. I think alfajores are as synonymous with Argentina as dulce de leche is. I loved the ones that were completely encased in chocolate (obviously), but the petite ones simply rolled in coconut (see photo here) were addicting as well. That photo was taken at an end-of-harvest, hours-long lunch we had just north of Mendoza. It was an absolutely, unforgettable day. For the cookie, I started with a classic sugar cookie dough. Similar to a traditional alfajores it uses powdered sugar instead of granulated as the sweetener. Where I differed was with the cornstarch. I used a lot less cornstarch than most recipes, but I don’t think you’ll be able to taste the difference and for me, it was a structure thing. We roll the dough nice and thick, using a 2-inch cutter for perfect, petite little rounds. I went for a dulce de leche that is mega infused with vanilla bean and cooked over low heat until it’s thick and bronzed. We finish it by whisking in a steady stream of olive oil and giving it a healthy pinch of sea salt. I don’t know if I’ll ever be making or eating dulce de leche any other way than this ever again. It’s a GAME CHANGER. COOKIE BASE. This cookie dough needs ample chill time to firm up. When rolling the dough out, I prefer to roll it out before two well-floured pieces of parchment, adding more flour as needed to keep sticking at bay. If at any point it gets too sticky, put it back in the fridge or freezer to chill and firm up a bit. It will be easier to handle. Additionally, don’t skip chilling the dough prior to cutting (once it’s been rolled out), nor prior to oven time. This later chill will help the cookies maintain their crisp shape while baking. I got only about 12 cookies because I kept the dough pretty thick. If you decide to roll it thinner, you’ll get more cookies and need to lessen the bake time so they don’t get too bronze and hard. DULCE DE LECHE. Man oh MAN don’t ever go back to using cans of sweetened condensed milk…it is such a poor substitute in terms of flavor to the real deal. It does not take that much extra effort to make it from scratch and I’m pretty certain at least half of you already have the ingredients in your fridge + cupboard. I give pretty detailed instructions below for making it, but I can’t stress enough two things: 1) Don’t increase the heat because it’s not bronzing fast enough…you can (and probably will) end up with a grainy dulce de leche if you raise the heat which is no bueno and, 2) Towards the end of the process, give it more attention because it’s going to be dying to boil at this point and you need to monitor the heat and keep it at a steady simmer, stirring more frequently in the last 30-60 minutes. DIPPING. I get great joy from dipping things in chocolate and I hope you’ll join me in this. We’re going to whisk our melted chocolate until it’s about room temperature and then we’re going to dip our chilled cookies in there and the chocolate will set like a breeze which is a) a dream and, b) means we have to move quick or…well…the chocolate sets fast! VANILLA BEAN. Using whole vanilla beans is an extravagance, for sure. They’re expensive and typically not something you have on hand, but the flavor is incomparable to extract. Since we’re using so few ingredients and the vanilla is such a key flavor, I say spring for the beans. Use a paring knife to split the pod down the middle. Don’t press the knife all the way through the pod, just enough to pierce and cut through the top layer. Then use the backside of the knife to scrape the vanilla bean seeds out of the pod. 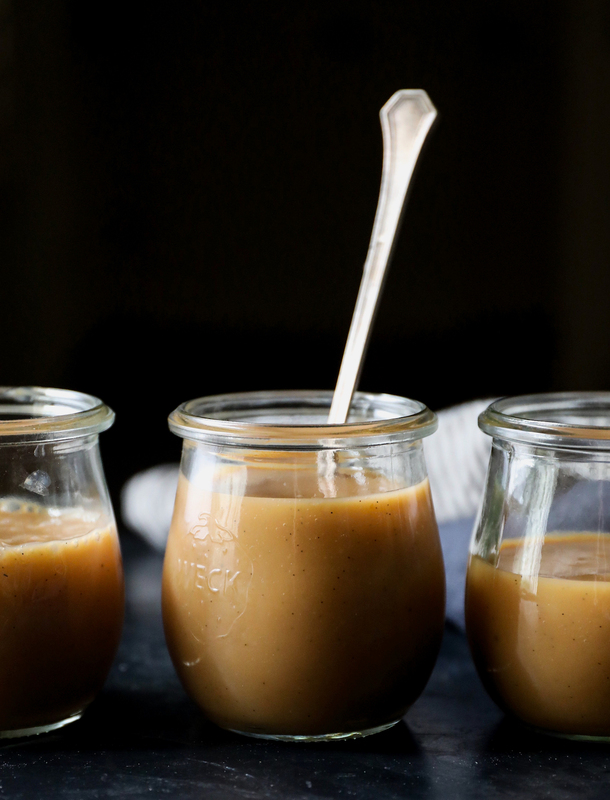 Add both the seeds and the pod to the dulce de leche while it cooks and then you’ll strain out the pod before putting the dulce in jars for storage. In a pinch, use 1 teaspoon of real vanilla extract in place of the vanilla bean seeds. 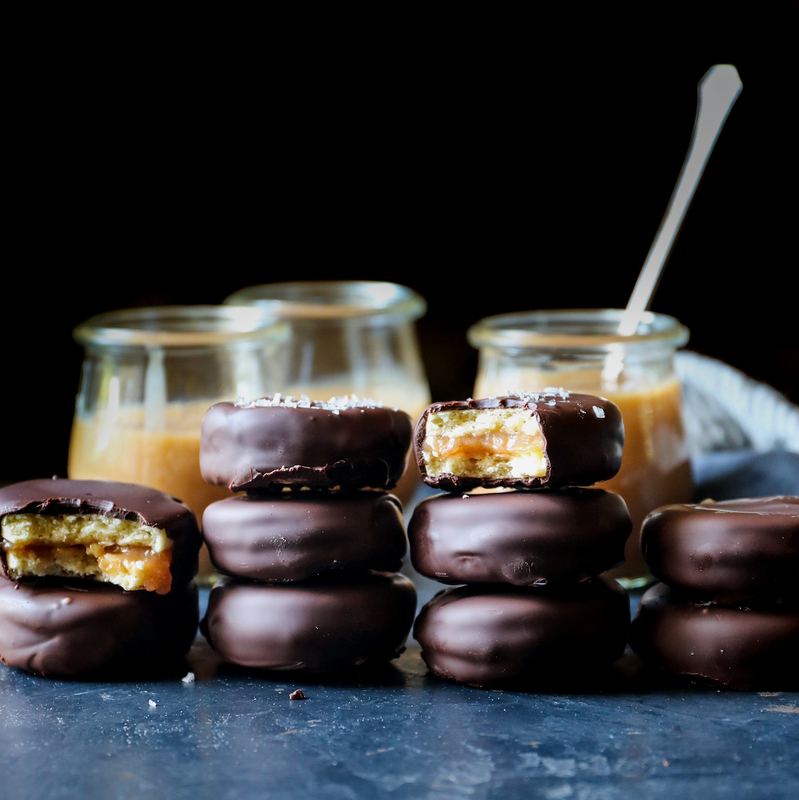 Shall we get our alfajores on? In a large saucepan whisk together the milk, sugar, vanilla bean seeds + pod and baking soda and bring to a boil. Reduce to a simmer and set a timer for 1 hour. Whenever you walk by the pot, give it a stir and adjust the temperature to keep it from boiling. When the timer goes off, check the color…has it started to change a wee bit? Usually between the 1 to 1 1/2 hours mark, the color starts to deepen and the mixture begins to thicken a bit. When this happens, it’s going to be more prone to boiling (which is bad), so stick near it adjusting the temperature as necessary and stirring more frequently. It should be done anywhere between 1 1/2 to 2 hours. You want the dulce to have a nice thick consistency as well as a bronzed and caramel appearance. Don’t raise the temperature if it’s not there yet, exercise patience (grab a glass of wine?) and continue to stir and meditate. Once the mixture has reduced and the color is deep and rich, strain it into a heat-safe bowl. Don’t skip straining!!! You want a nice, silky texture and this helps you towards that goal. Slowly stream in the olive oil, whisking the entire time to completely incorporate the oil into the dulce de leche. Sprinkle with the sea salt and whisk for one minute more. Pour into a lidded container and stash in the fridge until ready to use. The mixture will thicken up a wee more as it cools. Add the butter and powdered sugar to an electric stand mixer fitted with the paddle and mix on medium for about 4 minutes until smooth. Be sure to scrape down the sides and bottom of the bowl to make sure everything is incorporated. With the machine on low, add the eggs one at a time making sure the first is well blended before adding in the last. Add in the milk and vanilla and run the machine for 1 minute more. The mixture may appeared a bit curdled, this is fine. In a medium bowl whisk together the flour, corn starch and sea salt. Add to the mixer and run the machine for 1 minute on low or until the mixture just comes together. On a floured surface and with floured hands, pat the dough into a disc. This is a damp dough so don’t be super shy with flour as needed. Wrap the dough tightly and stash in the fridge for at least 1-2 hours or up to overnight. Cover several baking sheets with parchment paper. Set aside. Roll out the dough between two floured pieces of parchment paper. If you have a silpat, place it beneath the parchment paper to keep it from sliding around on the counter. Sprinkle the dough with additional flour to keep it from sticking and roll the dough 1/4 to 1/2 inch thick. Don’t go too thin. Place the dough in the freezer for 10-15 minutes (or the fridge for 20 minutes) to firm up. 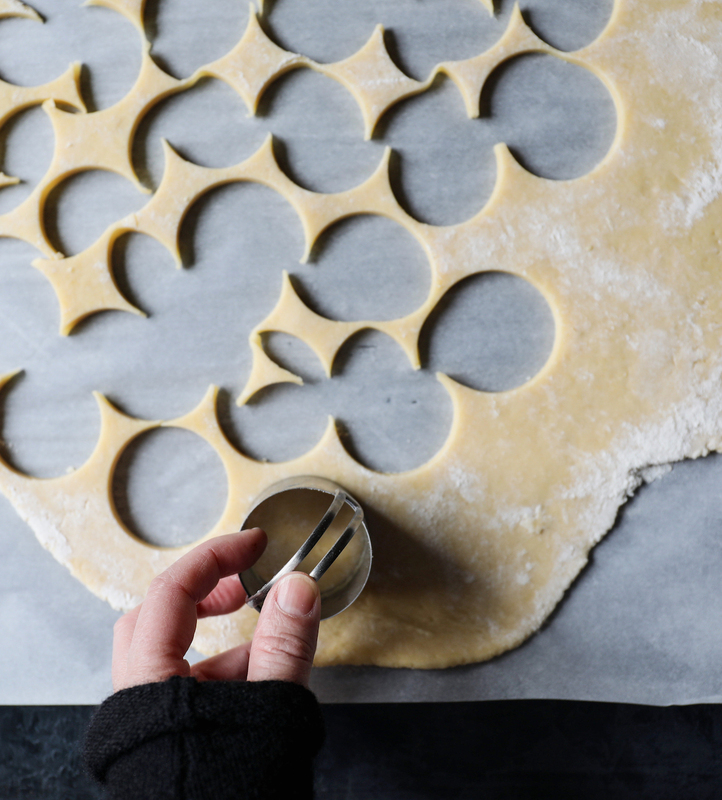 Use a 2-inch cookie cutter and cut as many circles as possible and place on the prepared baking sheets. Place the cookie cutouts in the freezer for 10-15 minutes (or the fridge for 20 minutes). Preheat your oven to 350F and place a rack in the top third of your oven, at least 6-inches from the heat source. Bake the cookies in the top third of the oven for 9 minutes. Let cool on the sheet for 10 minutes and then transfer to a rack to finish cooling. Cover a baking sheet with parchment paper and have a cooling rack nearby. Add the chocolate and shortening to a medium heat-safe bowl set over a saucepan of simmering water over low heat. Stir frequently. Once melted set on top of a towel on the counter and stir frequently to help it cool evenly. Continue to stir periodically while you prep the cookies. If the chocolate starts to become less liquid, set the bowl back on the saucepan with the heat turned off. Put a nice dollop of dulce de leche on the flat side of a cookie and top with a right-side up cookie. Set them on the prepared baking sheet and place in the freezer for 1 hour. Once firm and chilled through, dip them in the cooled chocolate, using two forks to help you dip into the chocolate and set on the cooling rack. Sprinkle with sea salt flakes if you’re feeling it. Once all of the cookies are dipped in chocolate (they should start to set immediately), use a spatula to gently get them off of the rack and set them back on the baking sheet to set completely. They are ready to serve immediately. I really like keeping them in the fridge and then bringing them out a half hour-ish prior to serving. This is muy non-traditional, so just a thought. Thank you so much for making these alfajores! Please tag me @displacedhousewife #displacedhousewife on social media so I can see this chocolate dipped, olive-oil wonders! If you haven’t already, head over to the recap of my trip to Argentina — Argentina is the most amazing place and probably my most favorite trip ever. I hope you’ll put it on your must-vacation list. Alfajores are as synonymous with Argentina as dulce de leche. 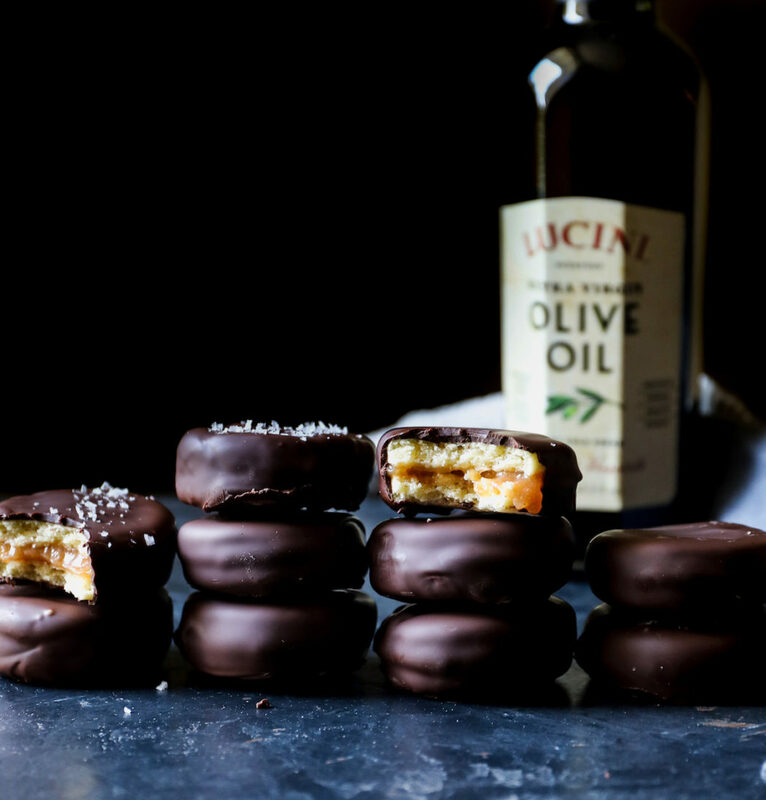 These dark chocolate dipped ones with olive oil dulce de leche were inspired by my trip there. 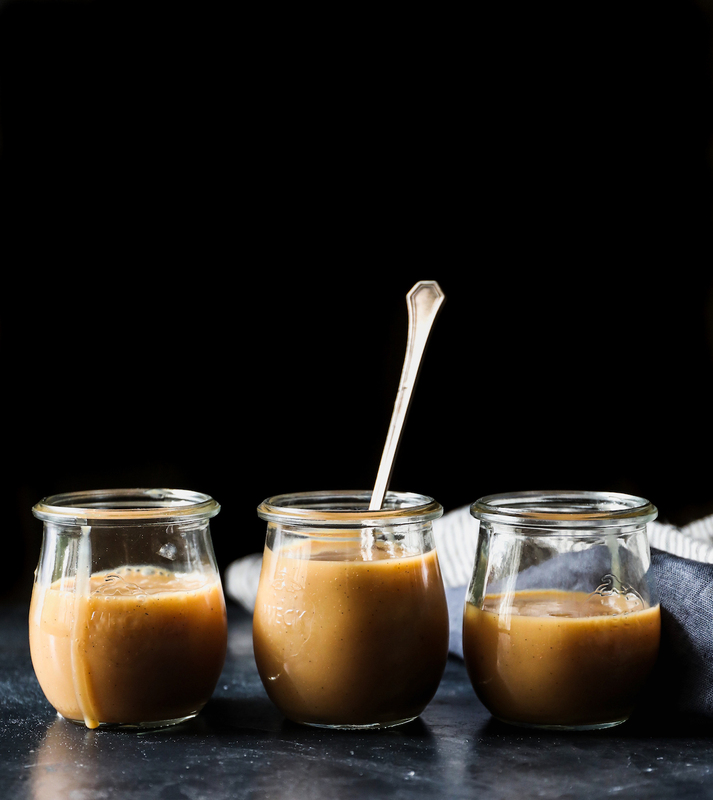 For the Salted Olive Oil Dulce De Leche: In a large saucepan whisk together the milk, sugar, vanilla bean seeds + pod and baking soda and bring to a boil. Reduce to a simmer and set a timer for 1 hour. Whenever you walk by the pot, give it a stir and adjust the temperature to keep it from boiling. When the timer goes off, check the color...has it started to change a wee bit? Usually between the 1 to 1½ hours mark, the color starts to deepen and the mixture begins to thicken a bit. When this happens, it's going to be more prone to boiling (which is bad), so stick near it adjusting the temperature as necessary and stirring more frequently. It should be done anywhere between 1½ to 2 hours. You want the dulce to have a nice thick consistency as well as a bronzed and caramel appearance. Don't raise the temperature if it's not there yet, exercise patience (grab a glass of wine?) and continue to stir and meditate. Once the mixture has reduced and the color is deep and rich, strain it into a heat-safe bowl. Don't skip straining!!! You want a nice, silky texture and this helps you towards that goal. Slowly stream in the olive oil, whisking the entire time to completely incorporate the oil into the dulce de leche. Sprinkle with the sea salt and whisk for one minute more. Pour into a lidded container and stash in the fridge until ready to use. The mixture will thicken up a wee more as it cools. For the Cookies: Add the butter and powdered sugar to an electric stand mixer fitted with the paddle and mix on medium for about 4 minutes until smooth. Be sure to scrape down the sides and bottom of the bowl to make sure everything is incorporated. With the machine on low, add the eggs one at a time making sure the first is well blended before adding in the last. Add in the milk and vanilla and run the machine for 1 minute more. The mixture may appeared a bit curdled, this is fine. In a medium bowl whisk together the flour, corn starch and sea salt. Add to the mixer and run the machine for 1 minute on low or until the mixture just comes together. On a floured surface and with floured hands, pat the dough into a disc. This is a damp dough so don't be super shy with flour as needed. Wrap the dough tightly and stash in the fridge for at least 1-2 hours or up to overnight. Roll out the dough between two floured pieces of parchment paper. If you have a silpat, place it beneath the parchment paper to keep it from sliding around on the counter. Sprinkle the dough with additional flour to keep it from sticking and roll the dough ¼ to ½ inch thick. Don't go too thin. Place the dough in the freezer for 10-15 minutes (or the fridge for 20 minutes) to firm up. Use a 2-inch cookie cutter and cut as many circles as possible and place on the prepared baking sheets. Place the cookie cutouts in the freezer for 10-15 minutes (or the fridge for 20 minutes). To Assemble: Cover a baking sheet with parchment paper and have a cooling rack nearby. Put a nice dollop of dulce de leche on the flat side of a cookie and top with a right-side up cookie. Set them on the prepared baking sheet and place in the freezer for 1 hour. Once firm and chilled through, dip them in the cooled chocolate, using two forks to help you dip into the chocolate and set on the cooling rack. Sprinkle with sea salt flakes if you're feeling it. Once all of the cookies are dipped in chocolate (they should start to set immediately), use a spatula to gently get them off of the rack and set them back on the baking sheet to set completely. They are ready to serve immediately. I really like keeping them in the fridge and then bringing them out a half hour-ish prior to serving. This post was done in collaboration with Lucini Italia. I’d like to thank Lucini for taking me on the most magical trip possible (that inspired these gems) and for being such an amazing partner. All content and ideas are my own. 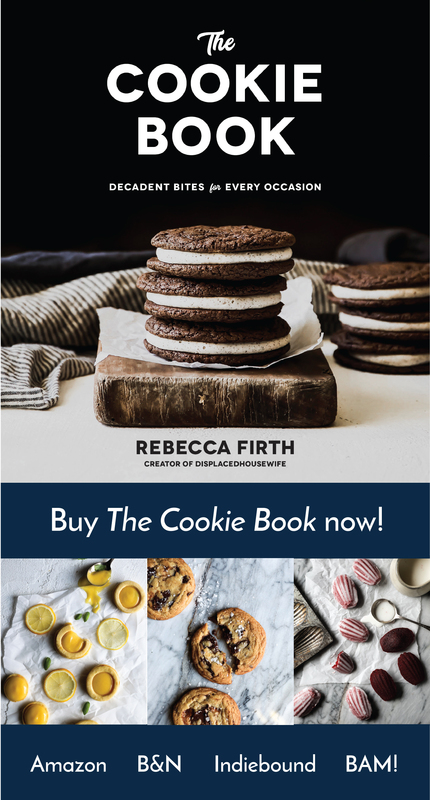 And thank you DH readers for supporting the brands that keep DisplacedHousewife in the kitchen — you guys are aces!! Can’t wait to see your travel photos from Argentina – it’s one of my favorite places on the planet! 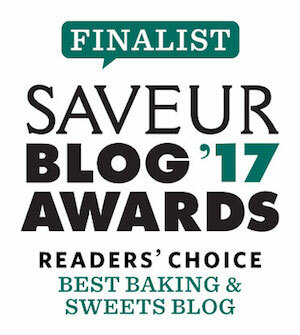 Perhaps this has something to do with the dulce de leche served at every meal :) I love your take on alfajores (yum!) And I’ll have to try your olive oil dulce de leche in my salted alfajores bars… can’t wait! I completely agree with you — one of the best places on the planet! I hope you try + love it!! These look amazing! If I wanted to double the number of cookies, would I need to double the dulce too, or does the recipe make enough? I spent over two weeks in Argentina and Chile last fall and had Dulce de Leche every single day, as you mentioned. I did like cookies without chocolate coating much more, though. And the empanadas! Had my first meal in Buenos Aires in a bookshop that used to be a theater. Thank you for bringing back my memories! Oh, how I wish I could grab a few of these beauties right off my screen Rebecca! They look and sound absolutely amazing! Sounds like you had a fabulous time on your trip! My son studied in Argentina while he was in college and just loved it there! I hope to get there one day too! It’s on my bucket list! Get out!!! 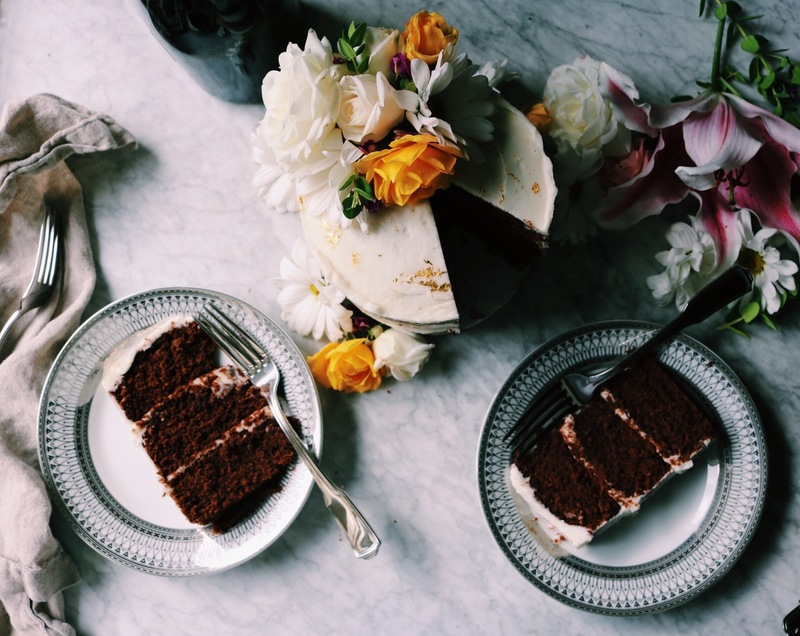 These sound delicious and look even better – your photos are AMAZING (per usual)!! Omg, l need these. They sound like a fun day in the kitchen!